A lot of people have questions about the nature of the criminal justice system and the career options it offers. This short examination of the subject is designed to help resolve your doubts and decide if a career in criminal just is for you! Law enforcement can be seen as the front lines of the criminal justice system. The courts can be thought of as the part of the criminal justice system where guilt or innocence of a suspect is assessed at trial. How Does Criminal Justice Work? The three pieces of the criminal justice work sequentially. For example, once a crime has been committed, law enforcement investigates. Once a suspect is apprehended, the courts take over. Although police and detectives may offer testimony in a trial, it is really the courts show until a verdict is reached. Then, if the accused is found guilty they are sentenced, and turned over to corrections. After release, law enforcement then works in conjunction with a parole officer if further attention is needed. How is criminal justice related to criminology? If criminal justice is the system through which crimes and criminals are processed then criminology can be seen as the study of the causes, costs and consequences of the crimes they commit. While the two disciplines work closely together, people who study criminal justice work on processing crimes and criminals while those who study criminology focus on the anatomy of the crime itself. People pursue careers in criminal justice for two reasons. Not only are they involved with the shaping of crime policy but also, given their intimate involvement with the application of justice, have a number diverse career opportunities available to them. Schools like The John Jay College’s School of Criminal Justice	specialize in careers in Criminal Justice and can offers career guidance for those interested in learning more. Who Works in Criminal Justice? There are many jobs available in criminal justice but they generally fall into one of two categories: law enforcement and legal. Law enforcement jobs are those that work to uphold the law (both before the trial and during corrections) while legal positions are more concerned with the application of those laws in a court of law. People who continue to monitor the convicted after their release. If you are considering a career in Criminal Justice, be sure to check out specialized programs. Learn more about studying criminal and forensic science in the USA by reading our growing article collection. « Study Guide by Subject	« Study Criminal and Forensic Science in the U.S.
Over time we will be updating this section and including more information for those who want to study criminal and forensic science in the USA and for other countries, but please feel free to post your thoughts and comments on our Facebook fan page, and also follow us and post questions through Twitter. 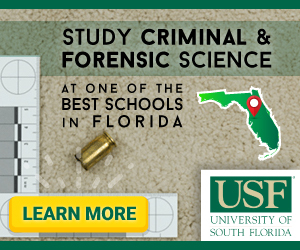 Visit the Study in the USA School search to find schools that offer programs of study in Criminal and Forensic Science.